Google just turned on the Buzz feature within my Gmail account and I am trying to organize my thoughts surrounding it. At first glance, I notice my stream has a lot of activity. It appears that Buzz pulls my Google friends' updates from sites like Twitter, Google Reader, Flickr, Posterous, and Friendfeed. The automatically refreshing stream feels a lot like Friendfeed, which is a good thing. My first cohesive thought regarding Google Buzz is the need for control. Similar to Friendfeed, Facebook, and Twitter, I would like to put people into groups to help control the amount of noise I am forced to see. Yes, there is a filter search, which allows me to take the overall stream of updates and search for key words and users, but it's not enough. At the same time, I'm wondering if my experience with other social networking sites has clouded my judgement. Should I use Buzz like I use Friendfeed, Facebook, or Twitter? If not, how should I use it? 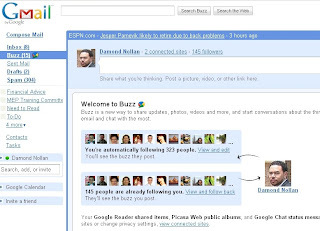 For many of us who have jumped on Google Buzz today, it feels an awful lot like our days with Google Wave and Reader. We are all just kids in a big toy store without instructions telling us how to play. I see many of the well-known technology gurus exploring and sharing their views with followers. Some of which have connections within Google, but not sure how much they already know. The most exciting part of new technology is the race to share what we learn about it. With Google Wave, it was keyboard shortcuts and then it was sharing waves with the public. Each new layer we pulled away, the more we understood about its inner workings. Within days, we should start to hear about feature hacks and official updates; each designed to engage more users and increase an already popular tool into stardom. Will It Be A Star? It is too early to tell if Buzz is going to find success or failure. Early reports are mixed. We have some, like Robert Scoble, who seem to recognize immense value. Then, there are others, like me, who have yet to understand how Buzz fits into the social network. Similar to Facebook and Friendfeed, Buzz appears to promote discussion amongst friends and colleagues. With each post, users can write text, add pictures, video, or share links. Followers, in return, can comment, like, or e-mail the post. As of now, I am not sure what to make of Google Buzz. I like it for its newness and similarities to Friendfeed, but secretly wondering if I'm using it effectively. Is there something there that I'm not seeing? How are the Google teams using it? How are you using it? Let's talk about it in the comment section below. If you're on Google Buzz, let's explore it together in a Buzz post. If you like what you've read, take this opportunity to subscribe to my RSS Feed and Newsletter. However, don't forget to connect with me on Twitter, Facebook, LinkedIn, Google Reader, or Friendfeed.